David B Samadi, with over 20 years experience in urology, has proved to be the best prostate surgeon, dedicated to compassionate and successful prostate cancer treatment. From his practice at Lenox Hill Samadi helps men of all ages overcome their problems, while preserving the highest possible quality of life after prostate surgery. 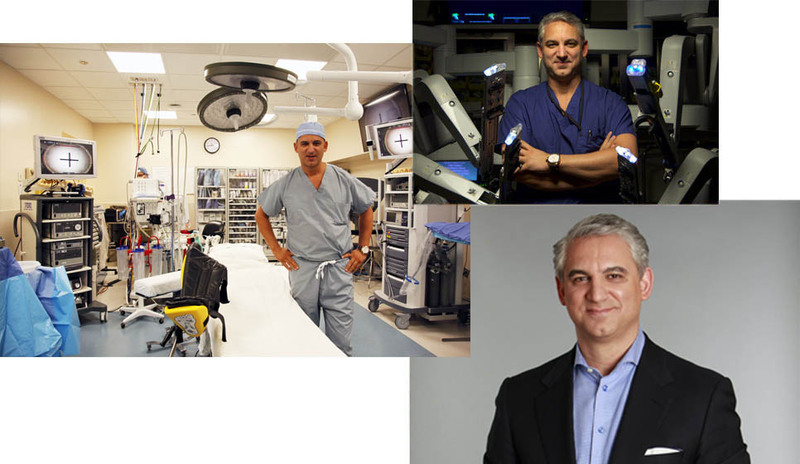 David Samadi has performed more than 7000 robotic prostate surgeries, earning his role as one of the best urologists and prostate surgeons around the world. Dr Samadi is also one of New York’s leading prostate surgeons and he is the only surgeon to perform the SMART surgery technique using the da Vinci robotic system. David Samadi is a member of the American Urologic Association and the American Medical Association. Dr. Samadi frequently presents his clinical research at medical conferences as a subject matter expert nationally and internationally. Behind every great robot, is a great doctor. Dr. David Samadi’s work focuses on solving one of the main issues of prostate cancer – early detection for a disease that basically has no symptoms in its preliminary stages. This is the reason for the appearances of Samadi on Fox News, as a medical correspondent, as well as for his written publications, blog articles and Youtube channel that all promote a preventive and healthy lifestyle. The benefits of getting tested are enormous because about 90% of the patients that are detected early will get cured. The PSA (prostate specific antigen) medical test is simple and fast with only your blood being analyzed, you have nothing to be scared about. Age isn’t a factor anymore when it comes to prostate cancer, so don’t wait around until you are 60 to get tested. Do it early and the benefits could make all the difference. There are lots of treatment options out there, such as active surveillance, radiation, HIFU, prostate surgery, so it’s important to detect the disease in its early stages and have time to decide on a course of action. Performing an average of 15 prostate cancer surgeries per week, Doctor David Samadi is a urologist surgeon with huge experience in treating prostate cancer with robotic laparoscopic prostate surgery. The technique is one of the most cutting edge technologies in conquering this disease and David Samadi’s Lenox Hill urology department has all the latest equipments, as well as welcoming and luxurious facilities, that make the patients feel taken care of and reassured. So what is robotic surgery and how it can help prostate cancer patients? To put it simply, robotic surgery is the future of medicine. The Da Vinci surgical system is the most advanced tool for minimally invasive surgery available at the moment. Using the DaVinci surgical system, Dr. David Samadi can transcend the limitations of conventional prostate cancer surgery, which already is a very complex medical procedure. It requires a big incision and side effects in the recovery stage like pain, infections and blood loss. Using the DaVinci system, the incisions needs will be considerably smaller and the so important prostate nerves that control both sexual functions, as well as bladder control, will be saved. In the hands of a highly experienced urologist like Dr. David Samadi, the results of a DaVinci and SMART robotic prostate surgery are immense, with a vast outcome. In essence, the less damage a surgery does, the faster the recovery of the patients will be and Dr. David Samadi can deliver all that with the DaVinci robot – little to no scarring, because the incisions will heal quickly. You can essentially be out of the Lenox Hill hospital within 24 hours after you had the surgery and, depending on your recovery rate, you can return back to work in 1 to 3 weeks after surgery. You can read more info on the new dr. David Samadi website.